Hello from Canmore, Alberta – a town of 14,000 located in the heart of the Canadian Rockies. 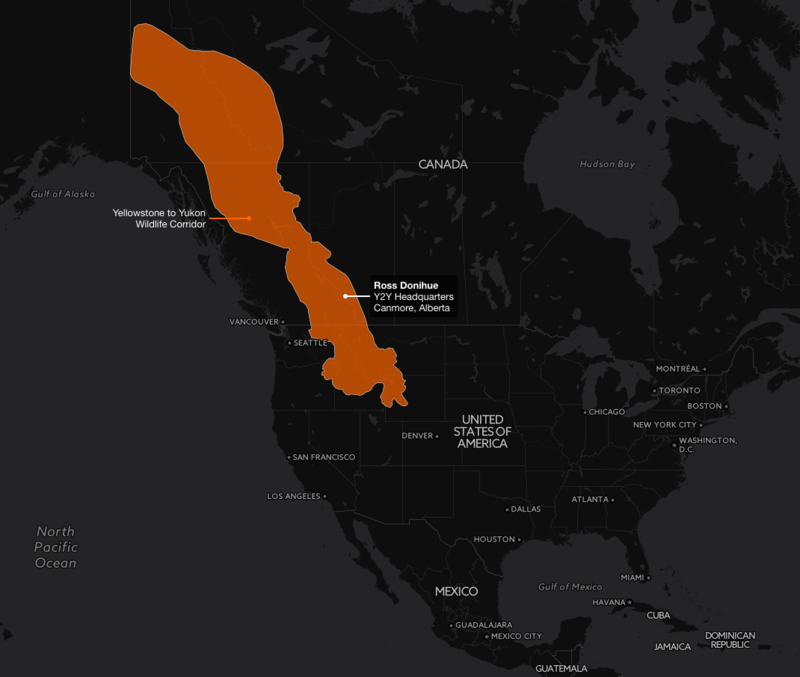 This summer I’m working with the Yellowstone to Yukon Conservation Initiative (Y2Y) throughout the wildlife corridor from Yellowstone National Park to the northern Yukon Territory. My main project for the summer is producing an interactive map of where coexistence projects are happening and what types of projects are going on there. Coexistence refers to humans living in harmony with wildlife so that both can thrive. This is a major issue within the Yellowstone to Yukon region because large carnivores (like black bears, grizzly bears, cougars, wolves) often live in the same places as people – conflict over resources like space and food can have serious consequences for both. I’m discussing the successes and challenges of past and present coexistence projects Y2Y partners across the Yellowstone to Yukon region to build a spatial and visual database of coexistence projects. I’m also using network mapping tools to explore relationships between Y2Y and their research and conservation partners. Canmore and the surrounding communities are a hotbed for wildlife. This is because of the Bow Valley – a rare east-west valley through the Rockies that’s fertile and wild. Elk are often seen walking through town and sometimes a grizzly bear on a sports field. The region supports an abundance of wildlife that live inside and outside protected areas like Banff and Jasper National Parks. Attractants like fruiting trees, garbage, bird feeders can make these animals more likely to venture into human settlements. The worst case scenario is that this leads to wildlife being killed and safety issues for humans (“a fed bear is a dead bear!”). It is through coexistence projects like bear-proof garbage containers, fencing, and city bylaws that human-wildlife conflict is being reduced. Conservation corridors like Yellowstone to Yukon are one important solution to managing the effects of climate change for ecosystems and wildlife. As ecosystems shift in unpredictable ways so will wildlife. Human settlements need to be prepared to support and coexist with the existing species and new species as they arrive. This means creating linkages in the landscape and wildlife sanctuaries for the animals to rest, recover, and move freely. I’m thrilled to be based in one of the epicenters of human-wildlife coexistence. Stay tuned for photos and maps from my summer research in this region. This entry was posted in Mapping, People, Western Research Fellows, Western Resource Fellows, Wildlife, WRF 2017 and tagged Ross Donihue. Bookmark the permalink.